Besides burgers and sushi, my other favorite food is sandwiches lol. Nothing like a good sandwich with fresh bread. A very popular place known for an amazing sandwich is in the city of Santa Monica called “Bay Cities Deli”, which I have been to multiple times and will blog about soon. But, if you live in the Valley, a great place for a good sandwich is Cavaretta’s. It’s similar to Bay Cities because it is an italian grocery store that has a deli inside that makes sandwiches. Located near the huge Topanga Westfield Mall, it is a great place to stop for lunch. I ordered the tuna melt with the works (lettuce, cheese, tomato, mayo, mustard, dressing) on a fluffly, fresh sesame submarine bread. It was delicious. Messy just the way I like it! 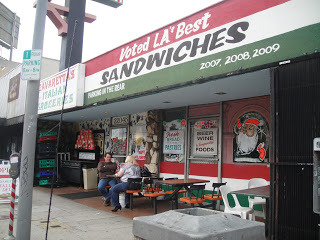 Cavaretta’s have won many awards for their sandwiches. It’s an authentic Italian little market that has a great deli. If you are around the Woodland Hills area and craving a good sandwich, Cavaretta’s is a good choice! Previous PostARNIE MORTON’S HAPPY HOUR! Next PostSAN DIEGO BLENDERS- BRAZILIAN ACAI BOWLS!